When I started to write this post I thought I’d tell how all my patience seems to be gone lately and the temperament, passionate side of me is lifting its head. This past few beautiful weeks of August have clearly turned me into what my horoscope is, a lion. But then I thought that there are much more interesting things than the length of my nerves. Such as this chocolate cake, that will change your life. I know this sounds like a brag (typical leo), but it’s not. As this is the easiest, fastest and most delicious chocolate cake I have made and it would be wring if I didn’t share the recipe with you. This cake is the end of result of me being a bit lazy. A few weeks ago I had friends coming over for the weekend and then last week I had a birthday picnic and in both cases I wanted to do as less as I could. But I definitely wanted cake. And even though raw cakes are my favorite dessert, I just wasn’t up for all that soaking and blending and freezing. Anything that takes over 30 minutes in the kitchen is not happening here at the moment. So what does this kind of impatient baker do? Well, first of all, she decides to skip any flour and only use a few ingredients to bake a cake. Also all separate steps are forgotten and instead, all ingredients are thrown into a blender. She’ll put up with the noise for a moment, then taste the batter and once she likes it, she’ll pour it into a cake pan and place to the oven. 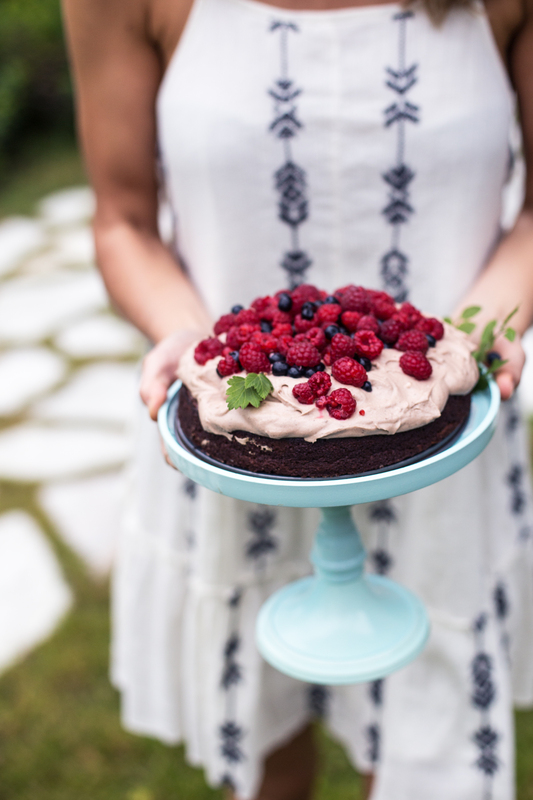 The end result: a gluten free chocolate cake that takes less than 30 minutes to prepare. A cake, that will charm the baker and everyone tasting it. It’s delicious fresh from the oven but it also gets even better after a day or two. I’ve made this for a few times now and served it the following day, when it has a more fudge-y, brownie-like consistency. I just baked the cake on the previous night, let it cool down in room temperature for a while, then moved it to the fridge overnight. 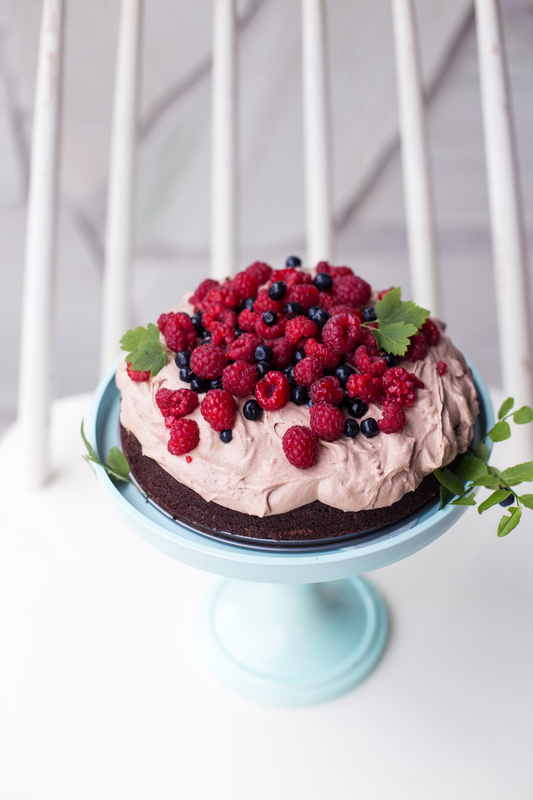 And on the following day I prepared the chocolate coconut cream and decorated the cake with the cream and fresh berries. It’s that easy! 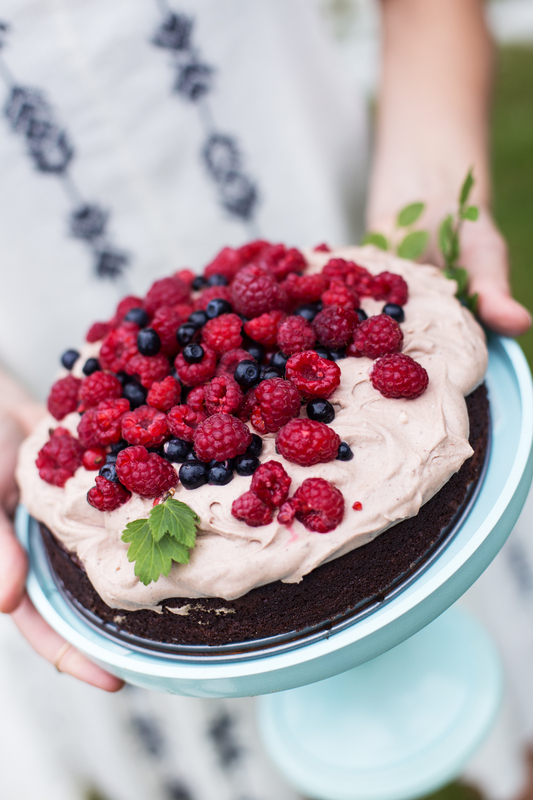 And if you’re not that into chocolate coconut cream (if that’s possible), you could also serve the cake with some ice cream and berries. I’ve tried it and it’s delicious as well. So all you patient and impatient bakers out there, this cake might change your life. Or not. But the point is that you will have to eat some cake in order to find out. And maybe you’ll even have to eat it twice just to be sure. All I know is that this one-woman jury here will happily bake and eat this cake at all times when impatience strikes. 1. Heat the oven to 200 celsius degrees. Cut the bananas into smaller pieces and place into a blender with the eggs. Blend until smooth. Add rest of the ingredients and blend until smooth. Taste, and add more honey or spices if needed. 2. Put a baking sheet inside a 20 cm springform cake pan, spread some coconut oil to the sides and pour the batter into the pan. Bake for about 20 minutes. Remove from the oven and let cool for a while before removing the sides. 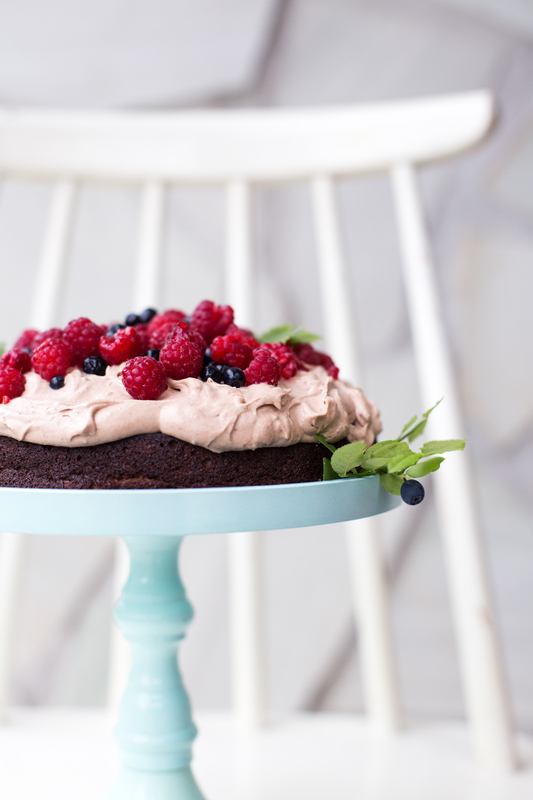 Once the cake is totally cooled down, decorate it with chocolate coconut cream and fresh berries. Open the coconut milk can and scoop out only the white thick stuff into a bowl. Mix with a spoon or with an electric mixer until fluffy. Add rest of the ingredients, taste and add more honey or spices if needed. If the mixture got too runny, place it in the fridge for a while until decorating the cake. 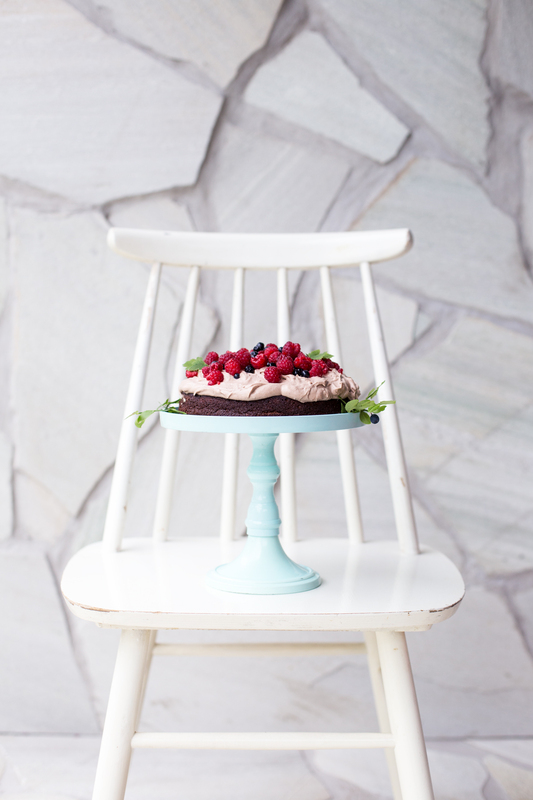 Tagged blender recipes, cakes, chocolate, dessert, grain free, nut free. This cake is gorgeous!! And I love how easy it sounds! I’m totally lazy too these days (must be the leo in me too ;)) I’m definitely making it soon. Thank you!